Prospect Transportation and its subsidiary, Alternative Fuels Transportation, provide transport services tailored to the needs of the petroleum industry. We combine an industry-leading commitment to safety and dependability with an array of value-added services that match the pressing needs of suppliers and fueling facilities alike. We enjoy strong, long-term relationships with ConocoPhillips, Shell Oil, BP, World Fuels, PSEG, ExxonMobil, Chevron, and most large and small independent fuel suppliers and utility sites throughout our marketing region. The carrier's primary job is delivering fuel safely and reliably every time. We adhere to our own strict guidelines for hiring, training, safety, equipment and maintenance, because we understand our clients' need to minimize the threat of loss, disruption and liability. A carrier also should offer exceptional operational flexibility, because customers needs can change in an instant due to unforeseen opportunities or events. Prospect Transportation is a leader in operational software, having developed products that are now widely used in the carrier industry. With a fleet of more than 250 tanker trucks, we can adapt to changing needs and target delivery windows that are unattainable for most carriers. To be truly exceptional, a carrier should understand the full range of customer needs and provide the services to meet them. Prospect Transportation leverages a powerful technology infrastructure to add value with inventory management, compliance assistance, tank monitoring and other services. We continuously work with clients to solve problems and develop solutions. To learn more, please call our office or contact us online. Ranked #1 in the U.S. in Safety Performance by the ExxonMobil Safety Tracking Group! Prospect Transportation is proud of its 92-week zero-incident/perfect safety record! 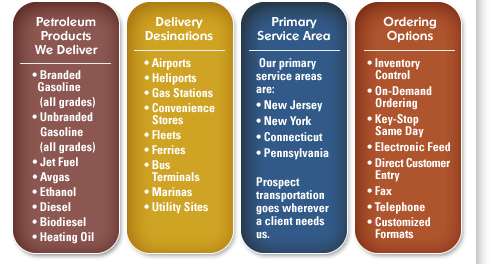 © 2019 PROSPECT TRANSPORTATION/ ALTERNATIVE FUELS TRANSPORTATION | 630 Industrial Road Carlstadt, NJ 07072-1611 | 201-933-9999 | SITE MAP .